With the Rio Olympics in the not too distant past, and the Non-Olympic-Weight World Championships yet to be contested, it seems a little early to be thinking about World Team Trials qualifying events. But last week at the Bill Farrell Memorial International tournament in New York City, athletes from around the globe battled it out at the New York Athletic Club. The top U.S. medal winner in each weight class earned a qualification for the team trials set for April 27-29, 2017 in Las Vegas. Two Iowans competed and took silver-medals at the Farrell Open. Lauren Louive of Massilon, Ohio and currently residing in Iowa City, wrestled for University of the Cumberlands in Williamsburg, KY from 2008-2013. She is a 4-time WCWA All-American and current volunteer Assistant Wrestling Coach at Cornell College (Mount Vernon, IA). Louive was a 2012 Senior Pan American Silver Medalist at 67 kg and is currently ranked #7 at 58 kg in the USA Wrestling Senior Rankings (November 16). Louive is training out of the Hawkeye Wrestling club in Iowa City. Louive went 2-1 for the day in the 58 kg weight class winning 3-0 over Hannah Taylor of Brock University (Canada) and 4-1 over Carla Ponce of Aries Wrestling Club (United States). 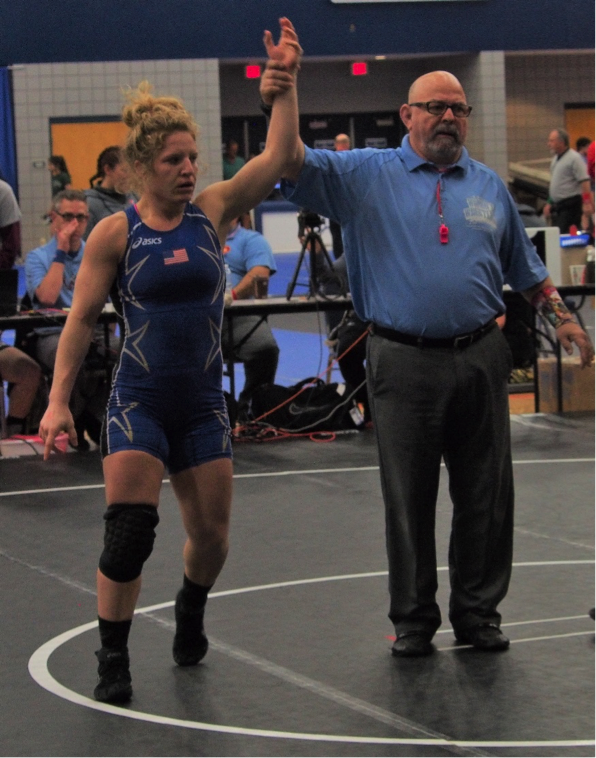 In the finals, Louive lost by 0-10 tech fall to Becka Leathers of Titan Mercury Wrestling Club (United States). Lauren Louive of the Hawkeye Wrestling Club. Photo by Holly Watters. Rachel Watters of Ankeny is a freshman at Oklahoma City University and is the current UWW Junior Freestyle National Champion (Body Bar) and UWW Junior World Team member at 72 kg. Watters is also the USA Wrestling Junior Freestyle National Champion (Fargo) at 159 pounds and USA Wrestling Junior Folkstyle National Champion at 159 pounds. Watters is currently ranked #6 at 69 kg in the USA Wrestling Senior Rankings and ranked #4 at 155 pounds in the Women’s Collegiate Wrestling Association (WCWA) College Rankings (November 7). Watters went 1-1 for the day in the 69 kg weight class with an 8-9 loss to Olivia DiBacco of Brock University (Canada) and an 8-2 win over Tamae Yoshi (Japan). With her silver-medal performance and top U.S. medal placement for her weight class, Watters has qualified for the World Team Trials next April. Rachel Watters of Aries Wrestling Club. Photo by Rachel Flores. The next opportunity for our Senior women to qualify for the trials will be the 2016 U.S. Senior Nationals on December 17-18 in Las Vegas. The top seven finishers per weight class will qualify. 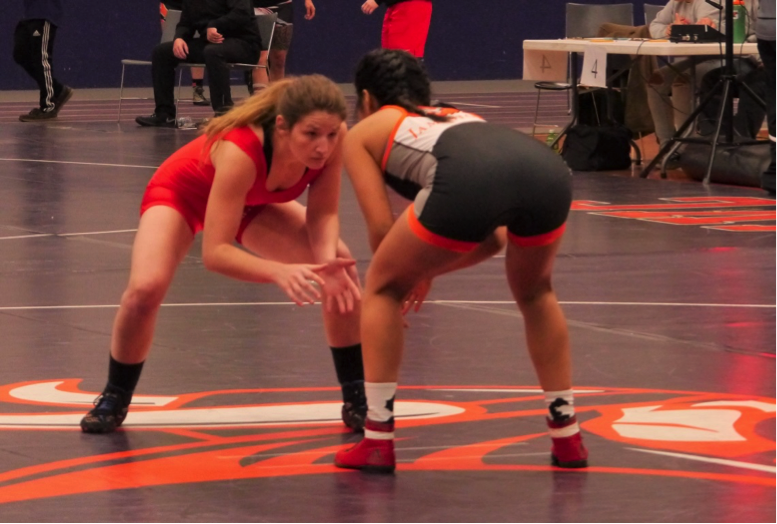 In duals action Paige Bendt of Glenwood, wrestling for Midland University (Fremont, NE) at 123 pounds, lost by fall to Tiffany Juarez of Ottawa University (Ottawa, KS), November 9th. On November 12th, Bendt received a forfeit from Waldorf at 130 pounds followed by a loss by fall to Chelsea Dionisio of University of Jamestown (Jamestown, ND). In the same November 12th duals, Justice Losee of St. Ansgar, wrestling for Waldorf University (Forest City, IA), picked up two pins over Josselyn Pacheco of Jamestown and Dashaia Young of Midland. 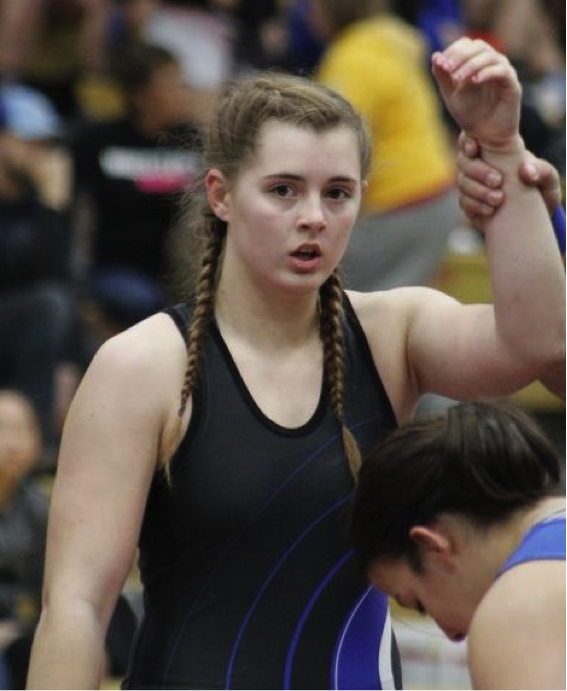 Also in duals competition, Anna Poyner of New Hartford went 5-3 wrestling for Missouri Valley College (Marshall, MO) in three separate weight classes. At 143 pounds, Poyner won by 12-0 tech fall over Taylor Kleemoff of Ferrum College (Ferrum, VA). At 130 pounds, Poyner gave up pins to #8 ranked Nicole Joseph of King University (Bristol, TN) and Cheyenne Youngblood of Missouri Baptist University (St. Louis, MO) before picking up a 12-2 tech fall win over Kristin Yamasaki of the University of the Cumberlands (Williamsburg, KY) and giving up a 1-12 tech fall loss to #4 ranked (123 pounds) Dominique Parrish of Simon Fraser University (Burnaby, BC). At 136 pounds, Poyner won 3-3 over Marki Simmons of Missouri Baptist, picked up a 12-0 tech fall over Sadie Tackett of Emmanuel College (Franklin Springs, GA), and won by pin over Zoe Wight of Life University (Marietta, GA). Megan Black of Batavia, wrestled in the 130 pound bracket as a redshirt junior for McKendree University (Lebanon, IL). Black, who is ranked #5 at 55 kg in the USA Wrestling Senior Rankings and ranked #2 at 130 pounds in the WCWA College Rankings went 4-1 for the day taking second place. 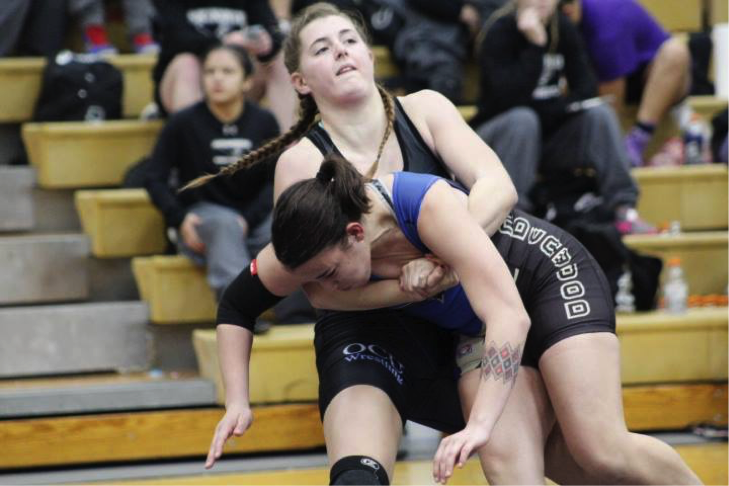 Black picked up a 10-0 tech fall over Raven Willard of Southern Oregon University (Ashland, OR) before pinning her way to the finals over Asia Igafo of Wayland Baptist (Plainview, TX), Justice Losee of Waldorf and Kalyn Shwartz of Southern Oregon. In the finals, Black lost to #2 ranked (USA Senior Rankings) Jacarra Winchester, a graduate of Missouri Valley. Black took 2nd place and sits at 14-1 for the season. Megan Black (left) of McKendree University. Photo by Holly Watters. Justice Losee, a senior for Waldorf College also wrestled at 130 pounds and went 2-2 for the day. Losee started strong with two pins over Hailey Meyers of MacMurray College (Jacksonville, IL) and Josselyn Pacheco of Jamestown followed by a loss by fall to Megan Black and a 5-14 loss to Erika Mihalca of Missouri Baptist. Losee improved her record to 4-2 for the season. Justice Losee (left) of Waldorf University. Photo by Holly Watters. Anna Poyner, a junior for Missouri Valley wrestled at 136 pounds and went 2-2 for the day. Poyner pinned Diana Nevarez of McKendree followed by a loss by pin to Brittany Bates of Wayland Baptist. Poyner followed that up with an 11-9 decision over Darla Allen of McKendree and a 3-8 loss to Gladdys Palma of Southern Oregon. Poyner’s record is 15-11 for the season. 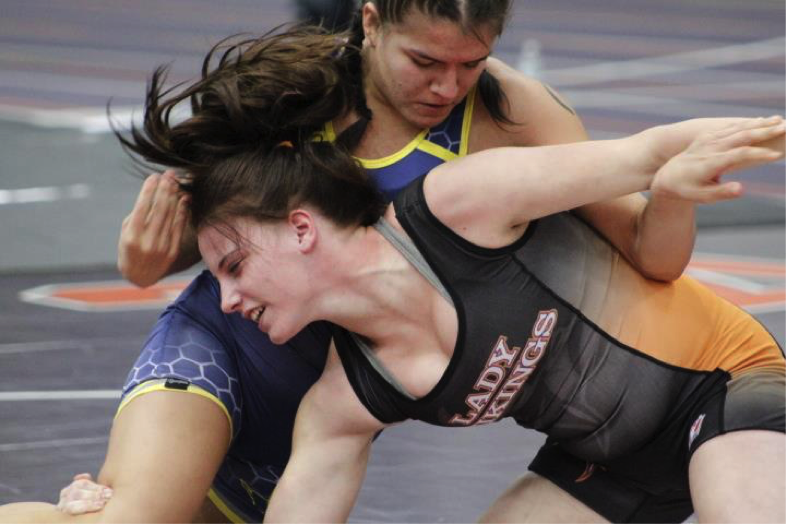 Anna Poyner (bottom) wrestling for Missouri Valley College. Photo by Rachel Flores. Jasmine Bailey, a junior for McKendree went 6-1, wrestling at 143 pounds. Bailey, ranked #6 had a 10-0 tech fall over Linette Ambriz of Bacone College (Muskogee, OK), falls over Addie Lanning of Ottawa and Anna Naylor of Cumberlands, a 7-2 decision over #7 ranked Marina Briceno of Wayland Baptist, and an injury forfeit from Skylar Grote of Lafayette College. Bailey’s only loss of the day was a 1-2 loss to #2 ranked teammate, Olivia Seppinni. Bailey later received a forfeit from Seppinni to take 3rd place for the day and improve her record to 16-5 for the season. Jasmine Bailey working a leg lace in competition for McKendree University. Photo by Rachel Flores. Rachel Watters, a freshman 155 pounder for OCU, went 5-1 for the day. Watters scored a 10-0 tech fall over Leslie Alaniz of Lindenwood University (St. Charles, MO), a fall over Elianet Herrera of Bacone, and a 10-2 decision over Andrea Sennett of McKendree, before losing a 6-7 decision to #8 ranked Iman Kazem of Menlo College (Atherton, CA). Watters continued with a 7-0 decision over Rachel Chinn of Menlo and a 1-1 decision over #6 ranked Alexandria Glaude of McKendree to finish 3rd. Watters improved her record to 14-3 for the season. Rachel Watters of OCU throwing a high gut wrench. Photo by Rachel Flores. There will be plenty of opportunities to come out and support your Iowa women wrestlers and we will continue to bring you timely updates throughout the season! Coming soon: The 2016-2017 Iowa High School Girls Wrestling Preview!!! 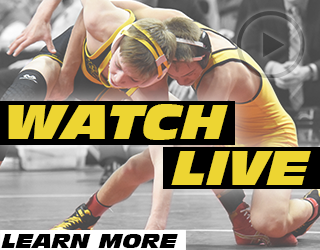 For updates, be sure to follow us on Twitter: @watters_ia, @FewTeamIowa, and @IAwrestle! Don’t forget to mark your calendars for the South Dakota State University women’s wrestling camp June 11-17 at SDSU in Brookings, SD. The camp will be run by USA Wrestling women’s head coach, Terry Steiner and SDSU head coach Chris Bono. 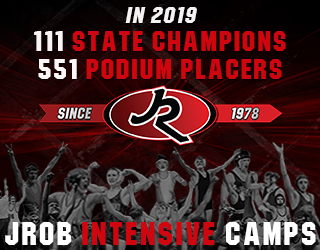 More details will come as we get closer, but this is a great camp to get on the calendar. 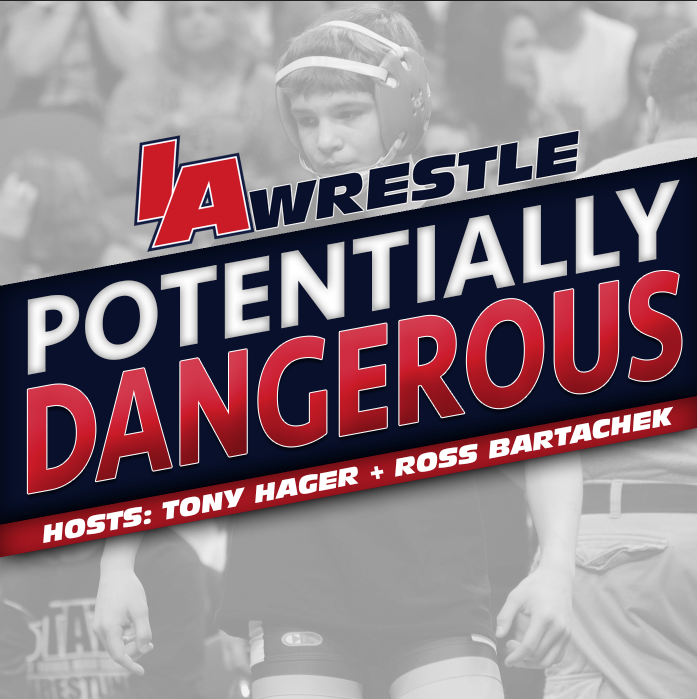 Know of high school, college or senior women’s wrestling info that was missed? Email me at: matt@femaleelitewrestling.org. 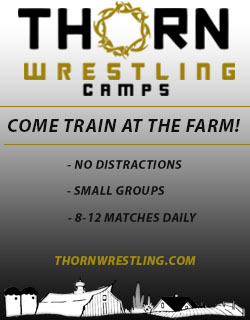 Interested in the benefits of wrestling at any age level? Contact Charlotte Bailey of Female Elite Wrestling (FEW) at: coach@femaleelitewrestling.org to find out more. November 21, 2016 in womens.